Here is my experience which finally forced me to change sales & service providers for my wheelchair needs. While this final ‘straw which broke this paraplegic’s back’ occurred over a year ago, I still fume at the lack of concern repeatedly exhibited over my concerns regarding their poor service. I can only conclude that Shoppers Home Healthcare –Bartley unit found the sales of wheelchairs profitable but had no interest (profit) in servicing the products they sell. The only positive comment I can offer to Shoppers Home Health Care is that their field technicians were excellent once I could obtain a service call, and sadly, they had the same negative view of their employer. Those who follow this blog may be familiar with the problems I experienced with my Permobil M300 wheelchair purchased through Shoppers Home Health Care –Bartley Drive Division. A major annoyance with the powerchair began approximately a year after purchase. A major squeaking developed when shifting weight or change of momentum (speeding, slowing, turning in the chair alone or when in a vehicle doing so). This can be seen and heard in a previous video post entitled 'Squeak!!'. This is a good place to start with my continuing problems with Shoppers Home Health Care –Bartley Street. September 4th, 2013 – Call Shoppers Home Health Care –Bartley Street repeatedly, only to reach automated answering service voicemail. No option to speak with live person so leave initial message explaining problem and subsequently messages requesting callback. Call-back requests are NOT returned. In frustration, I call Shoppers Home Healthcare, Central Equipment Pool’s service department. This was the Shoppers facility I dealt with when problems arose with my first chair. While I had some issues with them, I was always able to obtain service. So, I explain my situation and request service to which they happily agree. Service technician arrives, tightens bolts, squeak remains, says nothing more he can do, and charges me $65.00 for the service call. Now this Shoppers powerchair was still under warranty, but Shoppers Home Health Care –Central Equipment Pool and Shoppers Home Healthcare – Bartley Drive Division, are two different entities and so in spite of the wheelchair being sold to me by Shoppers Home Healthcare, the warranty would not be honoured by the other branch, unit, division or whatever. Who knew? One Shoppers Home Healthcare, Is not the other Shoppers Home Healthcare. Apparently within Shoppers, different wheelchair makes are handled by different wheelchair department, and only those departments. I got dinged $65.00 and protests fell on deaf ears. …and so, it cost me $65.00 to learn that Shoppers Home Healthcare’s Bartley Drive unit deals with the Permobil wheelchairs and that I should be calling them for all future needs. Service technician arrives, tightens nuts and bolts, but this time annoying squeak remains. Nothing more can be done. January 15, 2014 – The batteries appear to be failing on my year and half old Permobil wheelchair. Carry 30 pound electrical charger with me at work so that I can recharge my power periodically through the day. Call Shoppers Home Healthcare –Bartley Street unit’s Service Coordinator to request a service call. Reach voicemail. Leave messages requesting a call-back to arrange service. Call-back requests are NOT returned. By some fluke, I finally reached some other employee who manages to book a service call for me. January 16th, 2914 – Service call arrives and finds what they think is a loose battery cable. Tighten cable and believe problem is solved. January 17th through 20th, 2014 – Permobil continues to lose power rapidly throughout weekend. January 21st, 2014 – Once again, phoned Shoppers Home Healthcare’s Permobil Service Coordinator at the Bartley Drive unit, as instructed, only to reach voicemail. Left message requesting callback. Call-back requests are NOT returned. Try a different approach – call their 1-888 long distance toll-free line hoping to reach a live person. I may have reached their U.S. site, however, after explaining my situation and frustration, I am transferred to someone who informs me that they are not the appropriate person to book service calls through and that in the future I should call the Service Coordinator at the Shoppers Home Healthcare –Bartley drive unit, (&#@%!!). Out of “courtesy”, they book a service call for me “just this one time” for the following day between 9:00 am and 3:00 pm. January 23rd, 2014 – Called Shoppers Home Healthcare –Bartley Drive unit’s Service Coordinator to once again reach voicemail. Message stated “Out of office for the day”. No instructions as to how to obtain service when Service Coordinator not on-site. Once again phone local and 1-888 phone numbers and somehow reach a live person. They cannot book a service call, but transfer me to the Service Coordinator’s manager only to reach her voicemail. I leave the Service Coordinator’s manager a message outlining my need for a service call and my frustrations with not being able to reach anyone in charge of service! I request she call me back. Call-back requests are NOT returned. However, as service technician did call and come that day to replace my wheelchair’s batteries. I had to haul that heavy battery charger around with me for over a week! April 9th, 2014 – Bolts holding arm assembly repeatedly sheared off after numerous transfers, the last time with parts being lost. Chair needs servicing. -10:00 am Call Permobil Service Coordinator. Reach voicemail – leave message. No Call-back. -11:00 am – confirm she is in her office. Call Service Coordinator and leave second message. No Call-back. -12:08 pm - Informed that Service Coordinator is in a meeting. Transferred to her supervisor – reach voicemail. Leave message – No Call-back. 12:09 pm - leave second message on Service Coordinator’s manager’s voicemail. No Call-back! April 15th, 2014 – Wheelchair picked up for side arm repairs and left loaner chair. In a previous post 'Permobil Arm Problems -Continued'. I showed the ‘Rube Goldberg’ like mechanism Permobil has for the side arm assembly. In my opinion, the arm hinge assembly appears overly complicated for what it is to do as well as built with inferior materials which lead to breakage. May 5th, 2014 – some 20 days later, spoke with the Service Coordinator regarding the status of my chair’s repairs. Stated that she would find out and have someone call me on May 6th. No Call-back! May 26th, 2014 – some 40 days later, called Service Coordinator after taking possession of my wheelchair for information on the status of my repairs. After all, it was just a broken plastic spacer and sheared bolt on my sidearm assembly. With overnight courier express, how hard could it be to get parts from anywhere in the world and then to install them? Reach voicemail – leave message. No Call-back! May 27th, 2014 – call Permobil Service Coordinator once again. Reach voicemail. 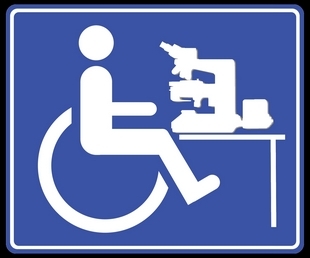 Yet again ask for information on the status of my wheelchair repairs. In frustration, state that my next call will be to the Technical Service Manager, to whom a year previously outlined my frustrations their lack of service. Mistakenly, I thought that taking my concerns to the head boss would instil some fear and action. Again, I foolishly requested a call-back. No Call-back! May 30th, 2014 – Call Shoppers Home Healthcare – Bartley Drive unit and somehow get a phone receptionist. Ask her to page the Service Coordinator. Finally get Service Coordinator on-line and once again relay my frustration in her lack of concern about my service requests. No response, no apology. I ask for the status of my chair’s repairs, now after being in their possession for over six weeks. “Will look into it and have a service technician call me later in the day”. On this day, however, I was informed that “the Permobil company representative was too busy to come down to the shop and see the problem for himself”. (no interest once the sale is made!) To remedy the problem, Shoppers took it upon themselves to install some sort of ‘transfer bar’ for that purpose. I questioned why it took nearly six weeks to replace the bolt and spacer plus install this transfer bar which I had not asked for nor agreed upon. May 30th, 2014 – Late afternoon. Service Technician called back. Tried to get bracket (?) from Central Equipment Pool, but his contact had gone for the day. Saw parts on ‘donor’ wheelchair a couple of weeks ago but now the chair is gone. (why was this not taken care of at that time??) “Will try to get parts by Monday of the following week and give me a call back then”. He will find out when the chair can be returned to me “so that I can try out the transfer bar to see if it works”. June 2nd, 2014 – Spoke with Service Technician (gave me his personal cell phone number). Obtained parts and will install on my wheelchair. June 3rd, 2014 - Parts scavenged from another Permobil wheelchair and they had mismatched some round tubular part for a square tubular part…??? Won’t fit. Will try to fix the problem. Urhhggh! June 6th, 2014 – Service technician phoned to arrange delivery of wheelchair. June 9th, 2014 – Wheelchair returned to me with but with seat back cushion left back at the shop. Unusable as it stands. June 10th, 2014 – Wheelchair seat back cushion returned. Field Technician knows nothing about missing motor cover. Asked what I what I owe, Field Technician responds “nothing”. July 2nd, 2014 – Noticed that one motor mount cover which had a crack and I had also asked them to replace was now missing. Cover is same colour and contour as the motor and base so part not immediately obvious. Purpose appears to keep weather off of the motor and mechanism used to disengage the motor gears (for manual pushing). I call Shoppers Home Healthcare –Bartley Drive Permobil Service Coordinator yet again regarding the missing wheelchair motor cover. Reach voicemail – request call-back. No call-back! July 4th, 2014 - In frustration, call the Service Technician who worked on my wheelchair regarding missing motor cover Technician says he will find out and call the following week. July 11th, 2014 – Service Technician calls to say that their Permobil company representative stated “no cover was available and that it would have to be ordered from the United States. Urhhhgh!! It was one of the issues I asked them to take care of months ago when they first took possession of the wheelchair. I decide to forget about the cover but was now told that I would be charged for the parts and labour for the transfer bar. I informed them at it was of little use and if I am to be charged after this length of time, for a modification I had not signed off on, that they could come and remove it from my chair. I now knew that my original cover was gone for good, and in my frustration, I decided to cut my losses. Not being a critical item I decided to forget about ever seeing the cover again, and asked that a replacement not be ordered. The Service Technician said he would look into the work order and charges and get back to be. August 11th, 2014 – No Call-back from Service Technician as of this date, one month later. I assume I am not being billed for the work. I continue to operate my wheelchair with a structural part missing. That’s it! I’m done dealing with an incompetent company run by equally incompetent personnel. But I have to let them know what has driven me to this point of exasperation where I will no longer be doing future business with Shoppers Home Healthcare, be it service or purchasing my next chair. So I decide to send a polite, yet strongly worded letter, including the above timeline (with names included), cc’d to all concerned. Those people would be, first and foremost, the Shoppers Home Healthcare, -Bartley Drive Service (non-)coordinator, her immediate supervisor, and the Technical Services Operations Manager under whom they all operate. I had written to, and spoken by phone with the Technical Services Operations Manager previously on two occasions, expressing my dissatisfaction with what they consider service –obviously to no avail. 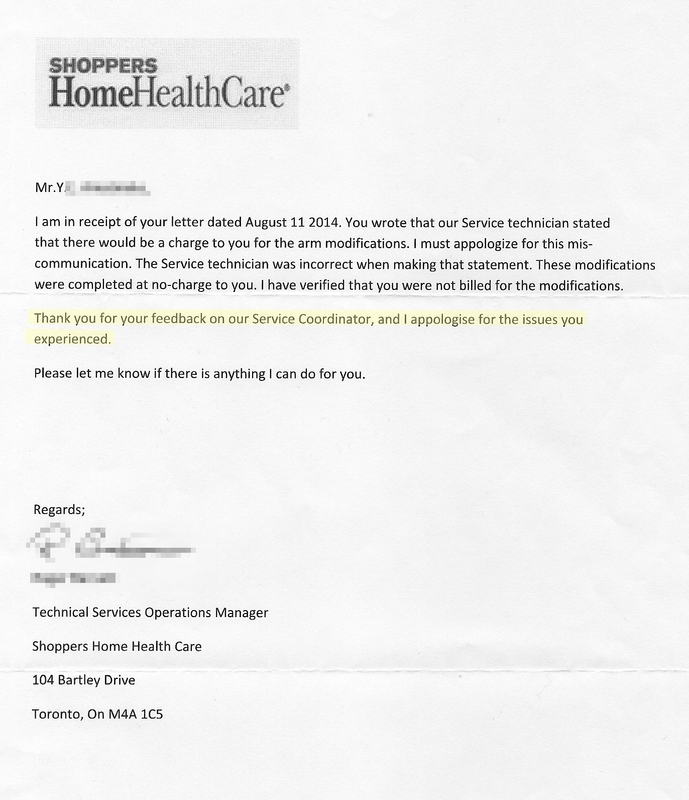 Finally, I included a copy of the letter and timeline to ‘Customer Service’ at Shoppers Home Healthcare’s corporate headquarters suggesting that this incompetence at one facility taints the entire brand of Shoppers Home Healthcare and their products. I was also going to write to the Better Business Bureau of Canada, however, I discovered that they are not a member……..and for good reason. It was early September of 2014 (Letter not dated and I didn’t keep the envelope) when I finally received one reply – only from the Shoppers Home Healthcare Bartley Drive unit Technical Service Manager. The depth of his concern is evident in his response below. Click on letter to read contents hidden by right margin. Shoppers Home Healthcare, Bartley Drive facility knows how to purchase 'voicemail' services, but have know idea what to do with the incoming messages. Count up the number of times I received no Call-back on voicemail requests. I believe if I remembered to document all, there are 21 un-returned calls. How do you run any business like that, particularly one where the most dependent of societies citizens may find themselves broken down, stuck in the middle of a crosswalk, in the rain, with a full bladder. And when in despiration they call their wheelchair service provider, they reach voicemail and receive................... No Call-Back! I was particularly disappointed that I did not receive a reply from the Shoppers Corporate Office. I explained in my letter that poor service in their Bartley Drive wheelchair facility reflects badly on their entire operation. 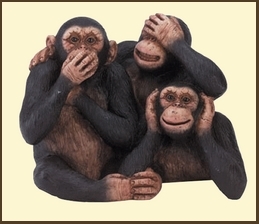 The poor service I receive in one Shoppers operation taints my view on all their operations. Shoppers Corporate Office was obviously unconcerned about my opinion as I never did hear back from them. I now take all my pharmaceutical and health care needs to their competitor, Rexall. Since last episode, where a minor repair took up the entire summer of 2014 and resulted in missing parts, I have found a new Healthcare & Wheelchair Sales & Service company ‘Motion Specialties’. Let me just give one example as to the type of service they have provided for me to date. Experiencing a problem with my same Permobil M300 chair, I called up Motion Specialties Service Department and was directed to voicemail. I left a message on their machine detailing my problems and requested a call-back in order to schedule a service call. I received a call-back within about 45 minutes and was informed that the technician was already on his way over. Now that is service. Having dealt with them several times now, from flat tires to major repairs on this rolling disaster of a Permobil, they have always been timely, competent and personable. So far it has been a joy to work with them and I have no reason to believe it won’t continue. So, if you want the quality of service which Shoppers Home Healthcare –Bartley Drive unit has, as outlined above, provided for me, I suggest you do business with them. Until my recent retirement, I worked at a large local hospital and had frequent encounters with various health care providers as well as disabled patients and the public. I had asked the Technical Service Operations Manager for Shoppers, Bartley Drive "what would you have me tell these people that I meet about your products and service?" I had no reply. They just don't care! As of March 22nd, 2016, Shoppers "We Don't Care" is divesting itself of the mobility device aspect of their business apparently to focus on pharmaceutical sales. Many others have had similar experiences to my own and have had to wait months and even a year for assessment and repairs with phone calls inquiries going unanswered. I truly believe this is not just lazy incompetence as you would have to make a concerted effort to be this bad and uncaring towards the disabled -the most vulnerable in our society!! Way to go Shoppers! To read more on the Shoppers Home Healthcare closing, visit my blog post by clicking here.